The Carbon High Track Team hosted 15 schools this weekend in one of the biggest invitational meets in the state, and despite facing larger teams and missing out on many points due to a scheduling conflict with Prom, the Dinos fought to place second in both the girl’s and boy’s team scores. 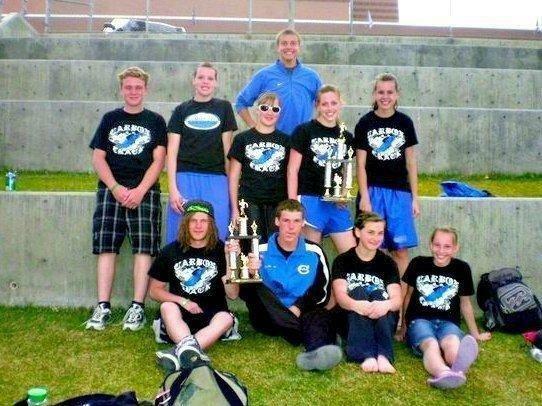 Those obstacles included “big name” track programs like Toole, Stansbury, Juan Diego and Judge Memorial, and were compounded by the many students who had to leave the meet early to prepare for prom, leaving the team with huge early morning leads that they could not maintain simply because the athletes were not there to compete in event finals or afternoon medleys. Some of the outstanding performers in the meet for Carbon included: Karissa Nelson placing first in 300-meter hurdles, second in 110-meter hurdles and 800-meter run, and seventh in javelin; Regan Powell winning the 3200-meter run and placing second in both the 1600 and 800; Kayleigh Potts and Kristen Jewkes placing second and third, respectively, with both clearing 5’1″ in high jump; Garret Marsing taking second in the 3200, 1600 and 800-meter runs; Dalton Nelson placing first and topping his personal best, with a 20′ 10″ long jump; Derek Quinton placing third, and exceeding the 20′ mark with a jump of 20′ 5″; Luke Olsen winning the 400-meter run and Tyler Johnson placing third in the 300-meter hurdles. To view complete results for the meet, go to http://results.runnercard.com/Results/results.jsp?meetid=3275.